Think about the people you love. Have you thanked them recently for what they mean to you? If the Lord called you home this evening, would you feel satisfied that you had told them everything you needed to say? In the last months of my (jcd) mother’s life, she had end‐stage Parkinson’s disease and was unable to communicate or understand us. One day, however, the Lord granted us a reprieve. When Shirley and I visited the nursing home, my mother instantly recognized us, and I was able to thank her for being a good mother, for staying true to Jesus, and for sacrificing to put me through college. She smiled; she understood. I told her that my father was waiting for her in heaven and that Jesus would say, “Well done! Thou good and faithful servant.” I prayed for her and thanked the Lord for her love in my life. She returned our love, and we said good‐bye. Do we tell our loved ones what they mean to us? What would you like to say to me “soul to soul”? Are we ready for the Lord to call us home? What should we do to prepare? Dear Lord, thank You for my lifetime partner. May we never miss an opportunity to say the words that really count. Help us to live without regrets, always ready for the homeward call of Jesus. Amen. I will make you a Hero of the faith if you chose to live for me. Every tough choice you make to obey Me will become a foundation of faith your family. Your commitment to my call will crave character in the next generation. Every prayer you pray will become a blessing passed down. Your and courage will continue to bring comfort to many during their difficult times. Your trust in Me will remain in others who watched you walk in peace. I, your God, declare on this day that your children’s children will be forever blessed because you lived your life for an audience of One... Me! On June 29 the Church celebrates the feast day of Saints. Peter & Paul. As early as the year 258, there is evidence of an already lengthy tradition of celebrating the solemnities of both Saint Peter and Saint Paul on the same day. 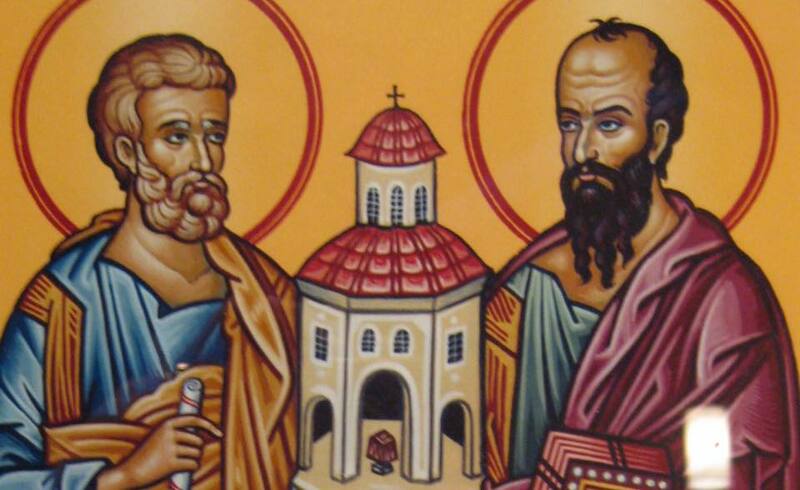 Together, the two saints are the founders of the See of Rome, through their preaching, ministry and martyrdom there. Peter, who was named Simon, was a fisherman of Galilee and was introduced to the Lord Jesus by his brother Andrew, also a fisherman. Jesus gave him the name Cephas (Petrus in Latin), which means ‘Rock,’ because he was to become the rock upon which Christ would build His Church. Peter was a bold follower of the Lord. He was the first to recognize that Jesus was “the Messiah, the Son of the living God,” and eagerly pledged his fidelity until death. In his boldness, he also made many mistakes, however, such as losing faith when walking on water with Christ and betraying the Lord on the night of His passion. Yet despite his human weaknesses, Peter was chosen to shepherd God's flock. The Acts of the Apostles illustrates his role as head of the Church after the Resurrection and Ascension of Christ. Peter led the Apostles as the first Pope and ensured that the disciples kept the true faith. St. Peter spent his last years in Rome, leading the Church through persecution and eventually being martyred in the year 64. He was crucified upside-down at his own request, because he claimed he was not worthy to die as his Lord. He was buried on Vatican hill, and St. Peter's Basilica is built over his tomb. St. Paul was the Apostle of the Gentiles. His letters are included in the writings of the New Testament, and through them we learn much about his life and the faith of the early Church. Before receiving the name Paul, he was Saul, a Jewish pharisee who zealously persecuted Christians in Jerusalem. Scripture records that Saul was present at the martyrdom of St. Stephen. Saul continued to Damascus, where he was baptized and his sight was restored. He took the name Paul and spent the remainder of his life preaching the Gospel tirelessly to the Gentiles of the Mediterranean world. Paul was imprisoned and taken to Rome, where he was beheaded in the year 67. He is buried in Rome in the Basilica of St. Paul Outside the Walls. I am always here for you. I’m never too busy to talk to you, My beloved. If you will turn off the things around you that drown out My voice, you will begin to hear Me in your spirit. When you don’t know where to go, you will hear Me give you divine direction. When you are in need of a friend, you will hear Me whisper, “I am here.” When you need comfort, you will hear Me call to you, “Come to Me.” Don’t let the voice of your own uncertainties distract you from My still, small voice. Quiet your spirit, and know that I am your Heavenly Father and you are My precious daughter--and I love when you listen to Me. “And he went outside and wept bitterly” (22:62). He cried and cried and cried. With every squawk of the bird. A fresh reminder. First thing in the morning. Have you ever been there? I have. I have failed. And I have remembered…the rooster crowed. And even though I asked for forgiveness, and I knew that God HAD forgiven me, the rooster crowed in my heart, and I remembered my failure anew. Jesus removed the shroud of shame hanging from Peter’s guilt-weary shoulders, and called him to get back to the ministry to which he was called.